Meet the robber crab: the largest land invertebrate in the world. The robber crab is the largest terrestrial invertebrate in the world. Adult robber crabs measure up to 1 metre and weigh up to 4 kilograms. 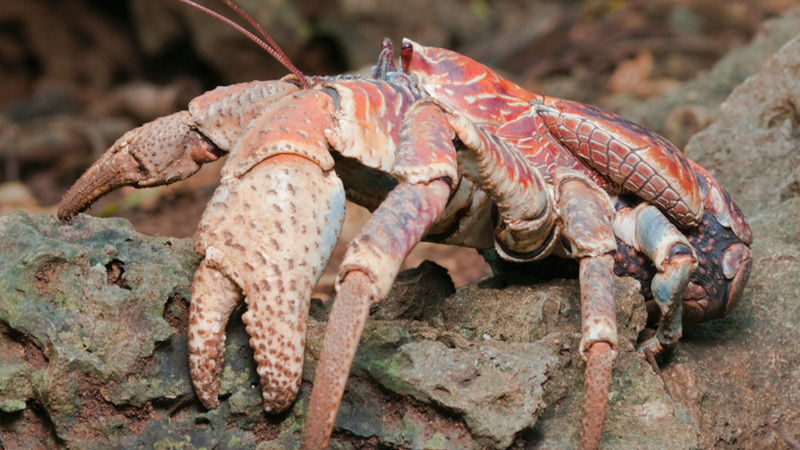 Robber crabs are also known as coconut crabs, because they like to eat coconuts. Unlike other crabs, adult robber crabs cannot swim or breathe underwater. With adults measuring up to one metre and weighing up to four kilograms, this giant crustacean is the largest terrestrial invertebrate in the world. Its name is the robber crab. When night falls, the robber crabs are at their most active.